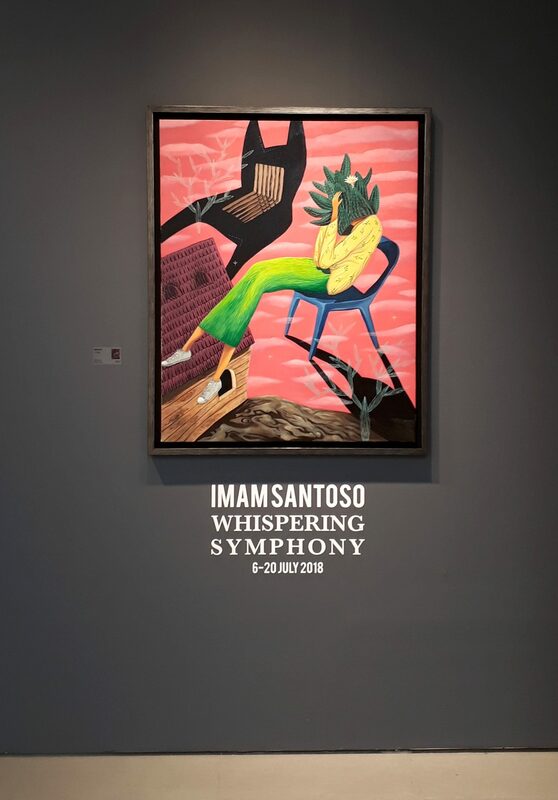 Whispering Symphony is the first solo exhibition in the Philippines, of young Indonesian painter Imam Santoso. 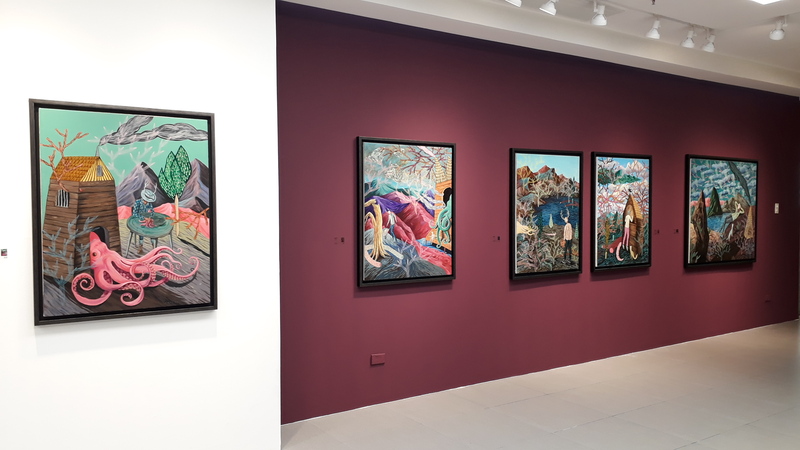 The thirty-two year old pop surrealist artist who got his fine art degree from the Indonesian Art Institute in Yogyakarta, presents, through Galerie Stephanie, twelve oil on canvas paintings characterized by an exciting palette of turquoise, magenta, pinks, and various shades of green, contrasted with yellows, ochres, and shades of brown; and accentuated by heavy, dark lines reminiscent of the strong Indonesian woodcut tradition whose visual appeal has, in recent years, been adapted into painting. 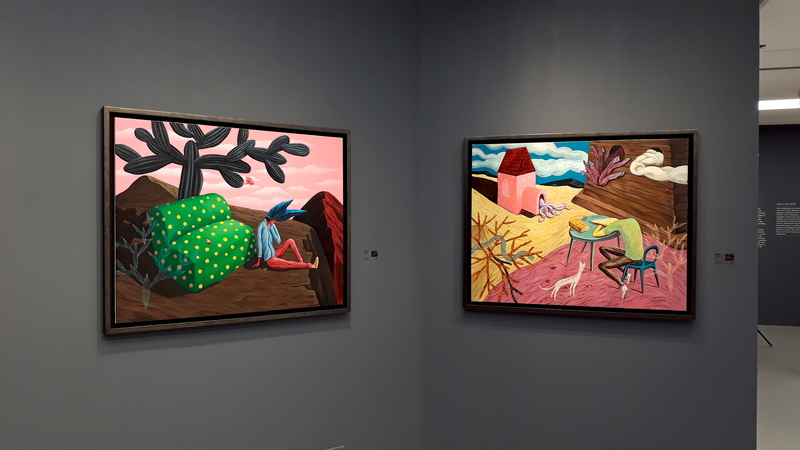 All of the works feature a solitary figure, whose face we never see, situated in a vast landscape bordered by hills, mountains, and sometimes, lakes. 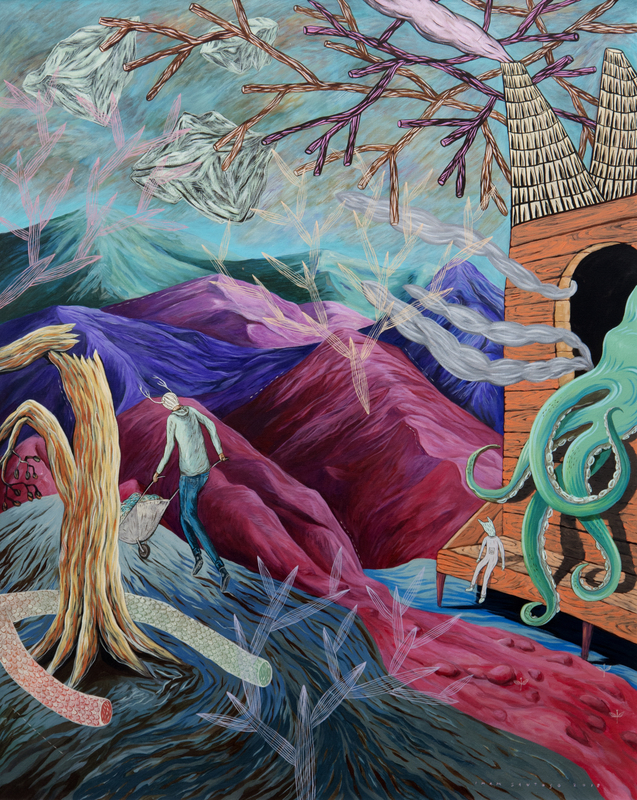 The landscape is rendered surreal, through Santoso’s imposition of repetitive organic forms like branching plants, spiky cacti, and tentacles creating patterns creeping and filling up the pictorial plane; creating a claustrophobic feeling which the artist contrasts intelligently against the open skies and vast mountainous landscapes. 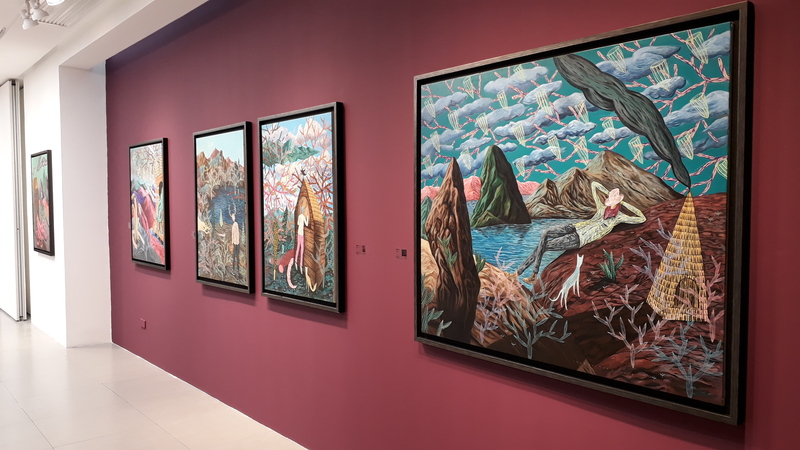 There is a stillness in the works of Santoso, and a solitude similar to what one feels when one is in front of a vast, open landscape, and things are brought into larger perspective. The persistent motifs of domesticity and home hint to us that these paintings are of the inner landscape of Santoso’s being; where life is rendered in its daily complexities and struggles, symbolized by the patterns and adornments which fill the pictorial plane; but which are rendered harmonious to the overall picture of the landscape. 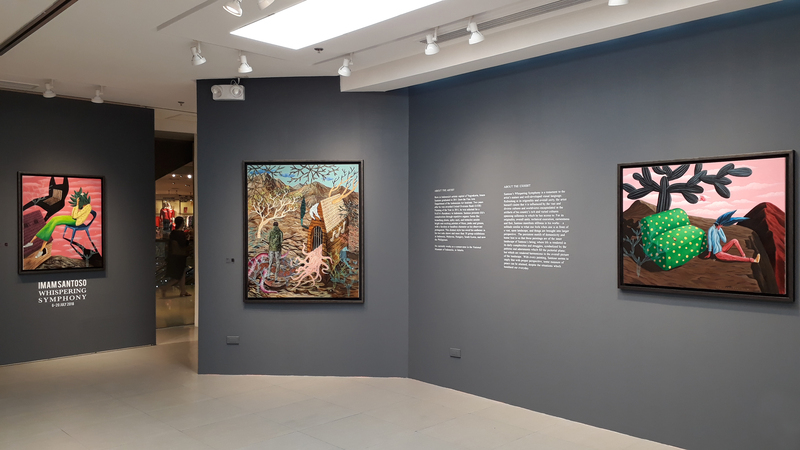 With every painting, Santoso seems to imply that with proper perspective, some measure of peace can be attained, despite the situations which bombard our everyday. 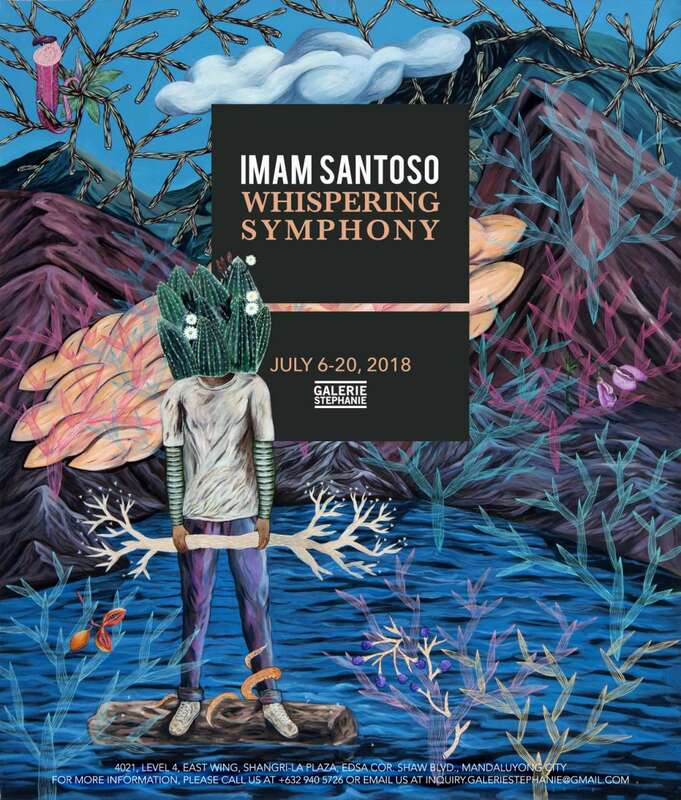 Santoso’s Whispering Symphony is a testament to the artist’s mature and well-developed visual language. Refreshing in its originality and overall unity, the artist himself claims that it is influenced, by the vast and diverse cultures and worldviews encapsulated in the artifacts of his country’s rich and varied cultures spanning millennia to which he has access to, as a conservator at the National Museum of Indonesia, in Jakarta, where he works. 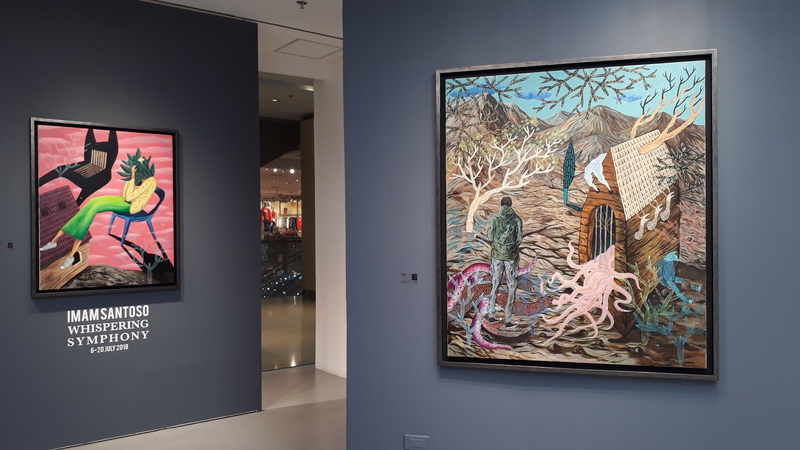 For its originality, overall unity, technical execution, earnestness and flair, Santoso’s exhibit deserves a visit from those who love a good art exhibition.